Oral chelation therapy is widely used for heavy metal detoxification. EDTA (ethylene diamine tetra-acetic acid) is the most commonly used chelator for heavy metal detoxification. EDTA attaches itself to heavy metals and carries the metals from the body. EDTA is safe and FDA approved for treating lead poisoning and toxicity from other heavy metals. A quality EDTA oral chelation formula will target mercury, lead, arsenic, aluminum, plus another dozen or so toxic heavy metals trapped deep within the organs, tissues and bones. Detoxification is the upstream approach to addressing chronic health concerns. Detoxification removes the root cause of the problem instead of simply addressing the symptoms. In traditional health care, symptoms are often addressed using pharmaceutical drugs, which can further add to the body’s toxicity. After cleansing to body of heavy metals and other toxins through chelation therapy, avoiding future exposure to heavy metals is important. First, avoid “silver” amalgam fillings and consider replacing silver fillings with porcelain materials. The porcelain is not as durable as amalgam fillings but they are more attractive and healthier. Silver (amalgam) fillings contain about 50 percent mercury by weight. Research studies show that even small amounts of mercury can damage the brain and internal organs and suppress the immune system. The World Health Organization reports that the daily intake of mercury from amalgam fillings exceeds the combined intake of all mercury consumed from food, water and air. A study of human autopsies found a strong correlation between the number of silver fillings and the amount of mercury found in the brain. Mercury is a suspected cause of Alzheimer’s Disease. Second, demand thimerosal free vaccines when vaccinating an infant. Thimerosal is a mercury based preservative used in vaccines. For every vaccine that contains thimerosal, there is at least one thimerosal-free brand. 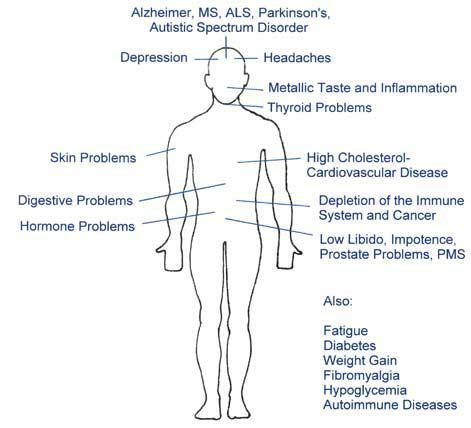 A growing amount of evidence links thimerosal to neurodevelopmental disorders, developmental delays, behavior problems, autism and Attention Deficit Disorder and behavior problems. Also avoid consuming bottom feeder seafood like lobster, oysters and clams that may contain toxic levels of mercury. Tuna, mackerel, and swordfish contain the highest levels of mercury of all fish. Mercury, lead and other environmental factors are everywhere – in the air we breathe, the food we eat and the water we drink. You might not be able to completely avoid all exposure but you can limit your exposure. To maintain health and remove toxins, detoxify the body annually with oral chelation therapy. Between detoxifications, maintain a regular exercise habit. Sweat release toxins from the body so any exercise program that causes you to break a sweat will cleanse the body and boost the immune system.